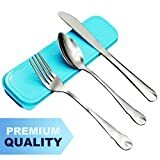 You need a BETTER QUALITY cutlery set for your next trip! • Made of durable and thick stainless steel. • Comes in a stylish, well designed plastic case that helps you keep it brand new! • Bring it to your office, camping, school, outgoing and vacations, it will fit many occasion due to its quality and design. If you’re looking for your next set of cutlery, that combines both portability and durability, look no further, you just found your match. 100% RISK – FREE SATISFACTION We offer you 100% Risk-Free Satisfaction to let you buy with confidence. DO NOT HESITATE!! GET IT NOW! !